Discussion in 'Disneyland Trip Reports' started by ClaraOswald, Jan 7, 2018. I am just going to jump right in to planning and introduce my family later. Right now....we are trying to figure out when to go. The original plan was actually to go to Disney World in early 2019. But our son has autism and developmental delays and we just don't feel he's ready for that yet. So why not head back to Disneyland one more like before the chaos of Star Wars Land?? So at first we thought February 2019. But then we decided that maybe we want to go around Christmas again. We haven't been to the parks during that time since 2007 and I really miss it! A few days ago, our hotel opened up booking for December. We had picked the dates 5th - 13th or maybe 6th to the 14th. The problem is that for some reason, the hotel is showing no availability on the 8th. I emailed them about it (I HATE making phone calls) but haven't heard back. If I don't hear by Tuesday, I am going to call. There are some other positives and negatives with June vs. December. We kind of know what to expect since we went last June. Crowds may be slightly less than Christmastime. Our son might still fit in his stroller, if needed. Less chance of flight delays due to weather. Being in the parks after dark since it gets dark so much earlier than June. February 2019 is also a back-up plan but since so many more rides are closed that time of year, I would prefer a slightly more busy time of year. So yeah....now we just need to figure out what to do! The hotel wrote me back. It was a glitch and they fixed it. Woohoo! So I booked for December. Last year, I booked 8 nights. But then when flights were released, they were quite a bit cheaper 1 day before the days I booked. So I switched our hotel dates and ended up having to pay a bit more for that night. The guy on the phone said next time I should book extra days at the beginning and end, then when flights are finalized, just take off the days I don't need. That way I get the cheapest rate. I took his advice and did that this time. I booked December 4th - 14th. But once again, we will only actually be staying 8 nights. So now we just wait until June or so before we can book our flights. That always stresses me out a lot since I'm so picky about times and layovers. Around that time, we will also book our rental car. We will likely use airline miles for that to save some money. I think we may pay extra for Max Pass even though I feel it's pretty expensive. Since rides like Small World and Haunted Mansion will have overlays and be more popular, it may be worth it for those. And if our son likes characters a lot still, then we plan to get more photopass pictures taken. Jaina and RedHotMama like this. Southwest released their flights for December. Sadly...nothing perfect, which I suspected. I basically narrowed it down to two flights one our first day. One is on Southwest and the other is actually on United. Now, if it was just myself and my husband....we'd pick the United flight. But traveling with our son makes things a bit trickier. On previous trips, we flew through Las Vegas. That made the first leg of the trip the longer one. I think that worked out well. On the 2nd flight, our son was definitely less happy and more antsy so I was happy the flight was short. So with the United flight, I worry about the 2nd trip being so long. Actually, both flights are sort of on the longer-side. But I do like that United flight leaves a half an hour later and overall, is a bit shorter of a travel day. Plus...it would save us some money. We also book back-up days for a different month in case we need to reschedule. We don't like to fly if any of us our sick (my husband's eardrums ruptured on a flight one so we don't risk that.) With the United flight, my miles would be non-refundable if we had to cancel. But on Southwest, we'd have 12 months from date of booking to use the funds. Because of that, I think I may be leaning more toward the Southwest flight. When I searched flights coming home...options were VERY slim. Honestly, there's just one flight we'd consider. It's on Southwest. The other flights were all way too early in the morning or much later. United had a good flight that left at 1:33 and arrived at 8:25. But it was 32,500 miles per person or $290 per person. But that's way too many miles. And the $290 wouldn't be refundable or reusable. So this option really isn't good. Anyway...I just need to figure out what flight I want to pick for that first day. Decisions decisions! I'm excited that you're planning another trip! I'm interested to see what you decide on for sure! Thanks! My husband and I need to talk about it some more still. I just can't decide. I am horrible at decision making with stuff like this. My husband and I are in our 30's (though my husband will be 40 for our trip!) 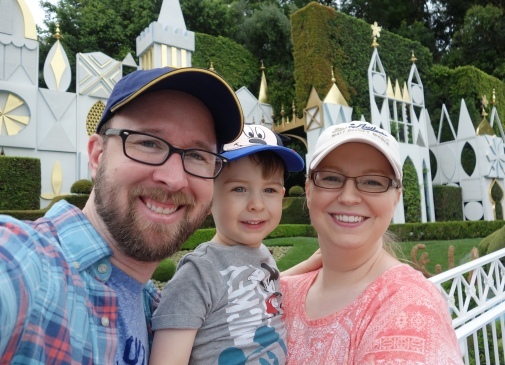 We've both been to Disneyland hundreds of times and Disney World a handful of times. Our son is 4 but will be 5 during our trip. His first trip was in February 2015 (report in signature.) In October 2016 he was diagnosed with autism. He also has various developmental delays. All of these things make travelling pretty stressful for us but we do it anyway. Our most recent trip was June 2017 and we had a great time. I am still working on my trip report (in signature) and hopefully will finish it before this next trip. I think we're going to go with the Southwest flight. My only hesitation is really that 3 hour leg of the trip. But...I think it may be the lesser of the evils. So later today I will probably book them. Hopefully the prices stay the same. Right now they are actually $173 each way. So that puts the total at $1038. I suppose there's a chance the prices could drop but since some of the other options on our days are $225, I think it's more likely that prices will go up. After the flights are taken care of, I'll probably figure out our car rental. Fun fun! Okay....so....I changed my mind a little. Ha! After talking about those morning flights we were a bit hesitant since we'd basically need to get up mega early to get to the airport on time. And I could already see us starting the day tired and stressed out. Last time we went, we left in the afternoon. Yes...that was stressful in some ways as well. But we thought maybe we should just do that again. The flight I picked is actually super similar to last time. Kept the same return flight I talked about. Price dropped a tiny bit. I was able to select cognitive disability on my son's ticket but we'll still need to talk to the gate agent when we get there. Hopefully getting priority boarding won't be an issue. It was super helpful last time. I booked our car rental. We will have the same SUV as last time. I used airline miles so it was essentially "free." Woohoo! Cost less miles than last time too. I just searched our Southwest flights to see what the prices are now. $255 each flight. So if we would have waited to book, it would have cost us almost $500 more. So glad we booked right away. I also called and booked our dog's kennel for December. She'll be there 9 nights, which is pretty expensive but she always does well there, for the most part. Unless I am forgetting something, I think the only thing left to book is park tickets. We'll likely wait until a couple weeks before to do that though. It is always good to hear that you saved money by making a certain decision!! We are only 74 days out from our trip. I feel way less prepared than last time. I mean, we have most things booked. Just need to get our park tickets. But I feel like last time I had more of a packing list going and more ideas for things to keep my son occupied on the airplane. Really struggled in that department right now! I am also super worried that he won't fit in our stroller but I want to use it at least some of the time...especially on the walk to/from the hotel. We haven't used it since our trip in June so we need to put it out and see if we can squeeze him in. He is on the smaller side for his age. Just turned 5 and is only 37 pounds. But he's never liked putting his feet on the little rest so I worry he'll just drag them on the ground. We'll see, I guess! 10 days to go. Crazy!! I am not sure how we'll fit all of our luggage into 2 suitcases. But really hoping to avoid a 3rd bag. With the forecast, I am just not sure if we'll want shorts or pants so that adds a lot more stuff to the luggage. I am starting to set things aside and next week I plan to organize it all and eliminate what I can. We put our son in his stroller and while he is pretty tall for it...it should work okay. I suspect he will walk a lot but I like having the option for him to sit. Plus, since he is still in diapers it will be nice for hauling all of that around. Wednesday, December 5th - Fly. Go to Target when we arrive. Thursday, December 6th - Disneyland/DCA. Friday, December 7th - Disneyland/DCA. Saturday, December 8th - Disneyland/DCA. Sunday, December 9th - Visit family. Downtown Disney. Relax. Target again probably. Monday, December 10th - Relax. Maybe go to Fullerton Arboretum. Tuesday, December 11th - Disneyland/DCA. Wednesday, December 12th - Disneyland/DCA. Thursday, December 13th - Fly home. The next 10 days are going to go quickly. I have a dentist appoint and a doctor's appointment. My son has ABA, speech, PT, and OT. Plus school. We need to get a lot done around the house. We want to try to get all of our presents wrapped so we don't have to do it when we get home. And, of course, we need to pack! Packing is just the worst and it stresses me out for some reason. It was so much easier before our son. I need to figure out what toys to bring for the hotel and also for the flights. Hey, how did all this go? I want to know! !